Content Objective: I will be able to evaluate my ability to argue for a claim by viewing the debate videos and completing the self-evaluation form. Language Objective: I will use complete sentences for my self-reflection. Homework: Come to the student-led conferences on Wednesday. 1. What was one element of the debate that was difficult? ​2. What was one element of the debate that was easy? 1. You will be watching videos of yourselves from the debate. Don't be shy! 2. 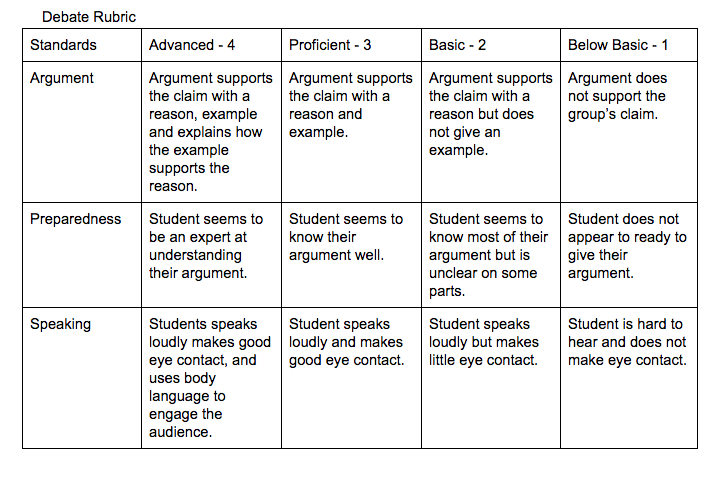 As you watch, look at the rubric and evaluate yourself by choosing a grade for each of the three components. 3. After we watch the videos, you will be writing a self-reflection on your performance. Self-Reflection Form: Click here to write your self-reflection. 1. We need to choose a new debate topic. 2. Write down 3 topics that you think would make for a good debate. Vote on our next topic.